When I was a kid, having my dad bring home the big red bucket of fried chicken was a real treat. We didn’t eat out very much at all and my mom always tried to cook healthy things for us to eat. She never made fried chicken but she did dredge chicken drumsticks in seasoned cornflakes or breadcrumbs, baked it in the oven and called it “fried chicken”. We weren’t convinced. For me and my brother, fried chicken came from a bucket and my mom’s shake & bake-style chicken was no rival for that dapper Colonel Sanders. 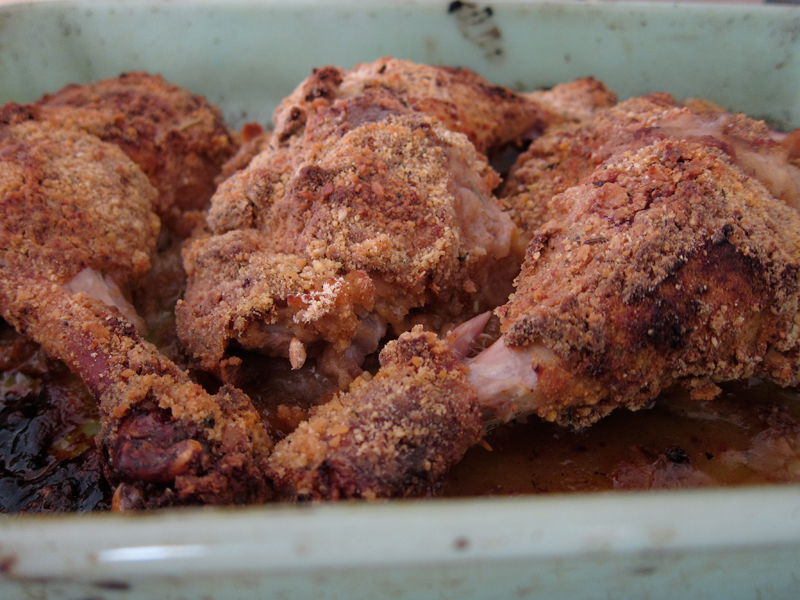 When it was my time to start cooking, I steered clear from dredging chicken parts in breadcrumbs. Instead, I roasted whole chickens, grilled up skewers full of spice, stewed chicken parts in sweet & sour sauces or braised them with wine. As an adult, I also stayed away from that big ol’ bucket. When I had fried chicken, I made sure it was fried chicken worth eating. But recently, a little bit of my resolve broke. I stumbled across a recipe from epicurious for oven-fried spicy chicken and I was ready to start dredging. The key here is not to start with seasoned breading (although that’s certainly a large part of it too), but to brine the chicken beforehand in a tangy marinade. The original recipe uses buttermilk, but I subbed in plain yogurt and a bit of milk and lemon and a whole lotta spice. It worked perfectly! Like the chicken found in the bucket of my youth, the crispy skin here is a real treat. There’s a definite crunch that shatters when you bite into it and chicken inside is flavourful, moist and juicy. I decided to bust out my three favorite hot sauces for use in the brine because I like my chicken with a lot of spice. I also used cayenne and smoked hot paprika in the breading to ensure an all-over spiciness. The chicken is spicy but it won’t burn your face off – if you’re making this for kids or you’ve got a wimpy palate, just use a bit less. As for the next day, this chicken still tastes great hot or cold. Serve it for dinner or bring it along to your next picnic in the park. Elsewhere: I know that you probably are a fan of my quick pizza dough. Over at Poppytalk, I went further and made a peach and escarole pizza. Yup, you heard correctly. It was fantastic! Check out the recipe and the amazing photos here. In a large bowl, whisk together everything from the yogurt to the onions. Submerge the chicken legs and let marinate for 3 hours or overnight, turning chicken occasionally. Preheat oven to 425F. In another large bowl, combine the breadcrumbs through to the cayenne pepper. Pull out a large baking dish so that it’s handy. Using one hand (for less mess), pull out a chicken leg from the yogurt bowl and give it a little shake to get rid of excess drips. 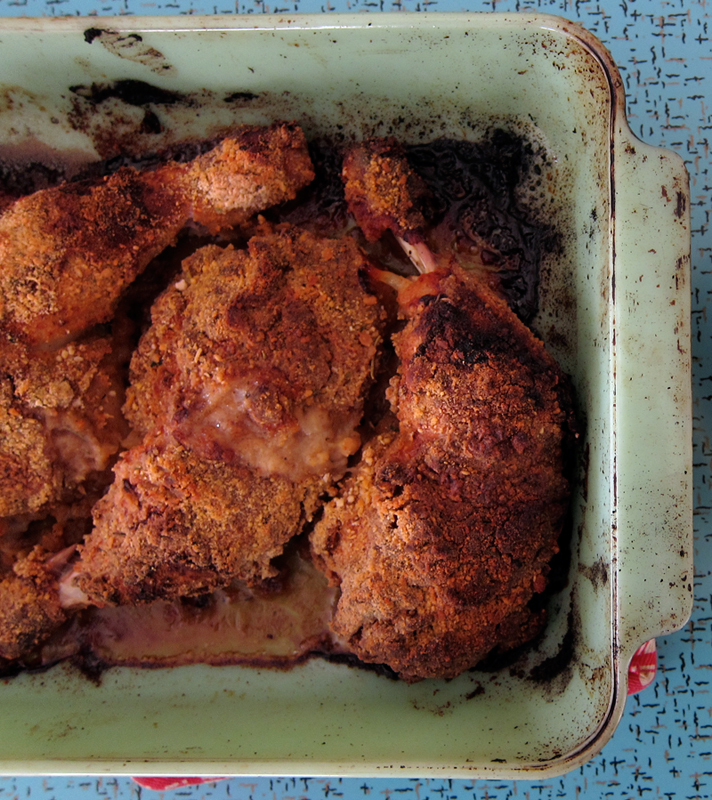 Dredge the chicken in the breadcrumb mixture and place it in the baking dish. Repeat with remaining legs. Dot each piece of chicken with some butter and bake until the chicken browns and gets crispy, about 50 minutes. I too loved fried chicken but won’t make it at home. I have a similar recipe to this one, but instead of breadcrumbs I use crushed cornflakes. And rather than the buttermilk I just substitute soy milk and it works great. It’s. So. Good. Same here with the red bucket chicken being an occasional once a year birthday treat. My mom was anti-takeout, anti-restaurant food although she did make shake ‘n bake often and sometimes even tried making a homemade version of KFC, which never tasted much like KFC, much to my dismay. My tastes have changed and KFC is off the radar forever. I seldom deep fry anything at home, as I prefer a restaurant to make the mess instead. I still find that I crave battered and fried foods on occasion though. This spicy over-fried chicken is a great way to satisfy the fried chicken craving without all the frying mess and grease factor! I like the spicy addition too. It looks delicious! Jeannette, I enjoyed your post, as always, and had the same KFC and shake n’ bake experience growing up. However, I’ve yet to find memorable fried chicken at any Canadian restaurants, so I try to eat it at certain places when back in the US – Midwest or South. It probably is time for me to try an oven version via your enticing recipe and even venture into the frying game. Brining absolutely does wonders for chicken and pork. I wouldn’t be surprised if it could also make chopped liver taste better. I love the sound of this recipe! I have been meaning to try oven-fried chicken for the longest time…your spicy version sounds right up my alley! now that’s a coating on the chicken! love that mac salad too. I might have to try this yogurt-marinated version. I just started getting into using panko breadcrumbs for breading. They make everything so crispy, without having to deep fry! Jabba, I’m glad you’ve also discovered the love of oven fried chicken. Will definitely try it with cornflakes next! Vanessa, that macaroni salad was a failed experiment. Boo! But the chicken is great. Yeah, Bijoux, I don’t deep fry at home either but this is a decadent solution. No grease and it’s so frickin’ finger licking good. Thanks so much Dan. Yeah, I haven’t had good fried chicken here either (though I’ve heard there are a couple places in town that make a good version). I too head down to the states when I want my fix. 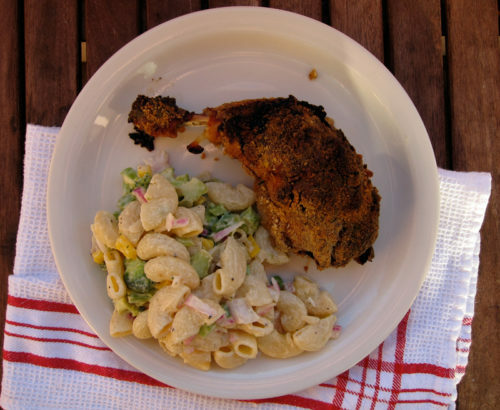 This version is an easier and quicker way to get my fried chix fix! Indeed Joanne. Brining is key. Thanks Newlywed, this is a great version…especially if you love spice. Yup, lots of good coating, vanillasugar! I’m sure you’d love it! Katina, panko would be a very worthy sub! I have to say…I’m in awe of your chicken photography. I know that’s an odd comment, but I find it really difficult to photograph meat well. Perhaps it’s all those years as a vegetarian. My mom did a similar thing with chicken in the oven–she used this blue canister of “italian bread crumbs” and called it special friend chicken. To this day, I sometimes crave it. Will have to give this one a try (looks like a major upgrade from the mysterious blue canister). I like deep frying at home. It feels like an adventure. That being said, I think I am totally going to give this a shot when I’m visiting my parents this week! Too bad your macaroni salad failed, it looks nice and retro. We’re meant to go have fried chicken at Refuel tonight…I’m totally excited! Just love it! I’m new to the blog and I have already made a couple of your delicious recipes. SO glad to have found you! Mmmmm. This looks soooo yummy!!!!!! My husband adores fried chicken, so we recently embarked on a quest to perfect our recipe. Last week at my parents’ house, I convinced my mom to make us some – she used to make fried chicken when I was a kid, but gave it up to shake & bake due to the mess. Cleaning up the backsplash, I can appreciate that point of view. 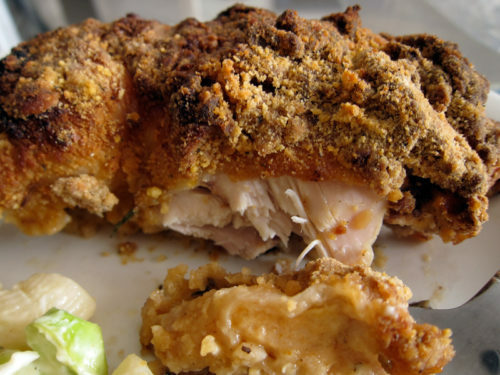 Spicy “fried” chicken sounds delicious … once we get over the meat coma from a week with my parents, I’m going to try out this recipe! Oh baby that sounds good! I’m currently marinating chicken in garlic, garden basil, lemon juice and salt and pepper to put on the grill. I wish I would have read this earlier – next time! Aw, thanks Megan! Trust me, there was a lot of photo taking since I’m not the best meat photo taker either! Lydia, you’ll have to tell me how refuel is!! I want to go & try it out. Yeah, Margie, deep frying leaves a mess & a smell. Here, it’s all good. Oven-frying, I’m totally convinced. Kimberly, your version sounds delicious too. I’ve never made fried chicken before. This looks great! I’m convinced. Also, the blue background in the first chicken picture, is that your table or something? it’s super cute! Ursula, yup, that’s my kitchen table. Thanks, I love it too! This was so good! I used panko and omitted the hot pepper sauce and the butter at the end — was that a necessary step? Regardless, the chicken was delicious, crispy, crunchy, and had a slight hint of spice (I added a little more cayenne to the panko in place of the hot sauce). Thanks for another great recipe! i’m gonna do it. i will make this!!! Kristin, so glad you enjoyed this dish! Not sure if the butter is necessary, but I thought it would add a nice richness. Lyndsay, yay! i hope you do!! First time I’ve ever cooked a meat dish for the fam(I’m 17 and live at home) so I’m hoping it will be good! Tish, hooray! I hope you & your family love it. Thanks so much for the nice words (& you’ve got some serious talent – I peeked at your site). Nice. nbm, I hope you love this as much as I did! Glad I could help, Judy! Enjoy. I am salivating as I read this…can’t believe I miss it when you first posted it! I will be un-frying this chicken promptly! I realize that I’m about a year late commenting, but I just wanted you to know that I’ve made it several times and just keep coming back to it. Ever tried marinating in Greek yogurt? Gives it a bit more of a twang, I like it. I also use panko and have been pleased by the results. I too am also late in commenting on this recipe, but I tried it tonight and it’s AMAZING. I was a bit worried it would be too spicy, so I decreased the amount of hot sauce, but I should have gone with the full 4 tbsp. The flavour was excellent! Thank you! this looks good! will do this for husband’s dinner surprise tonight who loves colonel s’ chicken! Gina, the breadcrumbs THROUGH the cayenne pepper – so yes, flour is included. Hope your husband loves the chicken! thanks!! we loved it! i also tried cornflakes as suggested by Jabba, and indeed, it made the chicken crispier! , its going to be our staple fried chicken from now on, thanks!!! I made this. Four of the ingredients (Parmesan, flour, thyme, paprika) are not in the recipe. The recipe has enough marinade for six boneless chicken thighs. Since they were boneless, I reduced the cooking time by 10 minutes. I tossed them in with the breadcrumbs, but I’m assuming that wasn’t right, as it came out kind of messy, not pretty like yours. Anyway, the chicken was tasty and well received, as are ALL of your chicken dishes. I don’t think there’s one I’ve disliked. That is, I tossed the four unlisted ingredients in with the breadcrumbs. Robert F, they are in the recipe, but I made it more clear. Instead of “combine the breadcrumbs to the cayenne pepper”, I just added “combine the breadcrumbs through to the cayenne pepper”. I thought it was clear (and clearly easier to type), but maybe I should list out the ingredients instead of taking shortcuts 🙂 But you were correct, those things get tossed with the breadcrumbs. At least it was tasty, right? Ah, much clearer now. And yes, very tasty. Odd that I can get 12 hour turnaround on ELS change requests tied to two-year old posts at no charge. Please renew my subscription. Glad you enjoyed it, S163!